Well, that's all folks! The first half of series 12 has come to an end, which sadly means this is our last blog for now! This week I'll be talking to you about patents and designs, two common themes in the final episode. The subject of patents was first introduced to the Den with the arrival of Hugh Roper and Nathan Wills. The duo were pitching for £75k in return for 10% of their company, Torch Apparel Europe. They instantly dazzled the Dragons with their US patented cycle helmet, complete with integrated and re-chargeable lights. However, the Dragons excitement soon faded when Peter Jones discovered they had a design patent. In the US, a design patent protects the visual appearance of a product (like design registration in the UK). This means that the features and the way in which the helmet works were not covered. For this reason, none of the Dragons chose to invest. 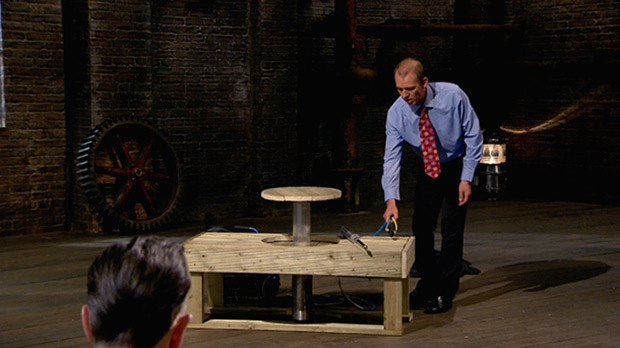 Later in the programme, we saw Jim Jemison with his patented space saving table, which can be built into decking and other surfaces. All I know is it's doing exactly the same thing as yours. So how does that make your patent worth anything? Patents are a great way to protect an invention but the process can be lengthy and expensive. Renewal fees are also payable on the fourth anniversary of the filing date and every year after that to keep it in force. Therefore, you may want to consider the current market and your target audience before applying. Our Do I need a patent? guide can help you with your decision. You've invented something no-one's going to buy, so I'm out. I am a little bit concerned that there is no patent protecting the actual facility and more designs can come up. Duncan was correct in saying that designs do not cover the functionality of a product. On this basis, perhaps a design wasn't the best form of protection for this product. However, when it isn't possible or cost effective to patent an invention, design registration may equally be as beneficial. Such was the case with Richard McLuckie and Stuart Mackenzie-Walker, owners of Pants on Fire games. You can’t patent a method for playing a game but a registered design could protect the overall appearance of said game. Registered designs can cover the shape of a product, a two-dimensional surface pattern or graphic design, or a combination of the two. Effie Moss was the last entrepreneur to enter the Den with her bespoke teepees for children. She was looking for a £50k investment in her company, Just for Tiny People®. Unless Effie has designed a new material or method of assembling the teepee, it is unlikely that her products will qualify for a patent. However, she may be able to protect her work with a registered design. Designs cost from as little as £60 per single application. A registered design provides a number of benefits including the right to take legal action against any copies of your work. Although there’s no official symbol to indicate a design is registered (like a trade mark), you can still display the design number on the product. This may serve to deter people from creating a design similar to yours. It's worth noting that from 1 October 2014 it will be considered a criminal offence to intentionally copy a registered design. This is just one of several changes to design law that will come into effect on this date. See our Changes to design law: business guidance for details. Congratulations to all the entrepreneurs in series 12, especially to those who secured investment. Do you think your invention could be 'the next big thing'? Head over to our business pages where you'll find a wealth of advice, including interactive learning tools and free downloads.